“Due to their inherent complexity, FX options have been the last FX instrument to move from OTC markets to electronic platforms, but best execution requirements are seeing options volumes and participants on our platforms really flourish. Reuters reports FX Options in the ‘Other Products’ category (red bars in the chart below), which saw an 8.8% gain in Dec 15 although only up 0.8% compared to Dec 14. 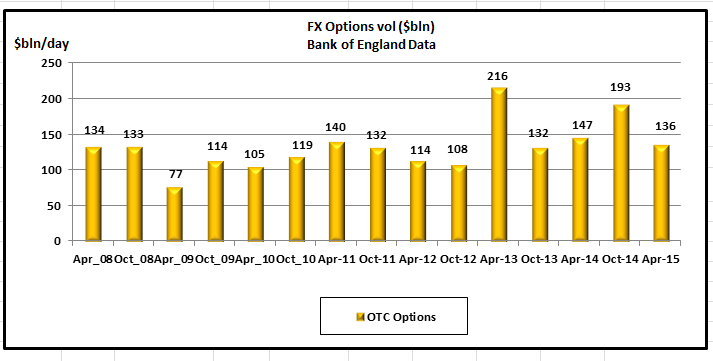 Overall, FX Options only accounts for some 6% of daily FX volumes. According to the Bank of England data, volumes fell from $193bn/day in Oct 14 to $136bn/day in Apr 15 a -30% fall over the 6mth period, and -7% lower than the $147bn/day in Apr 14. 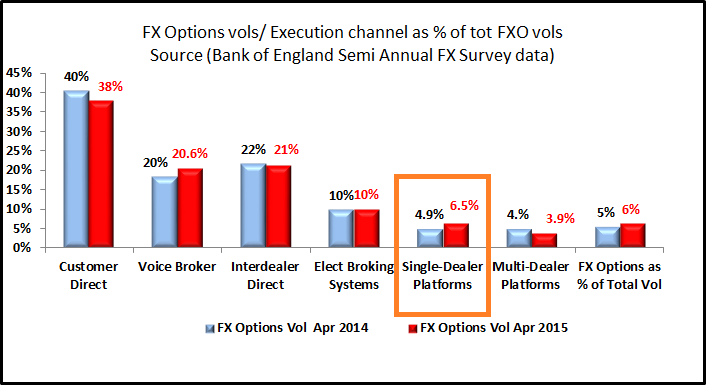 Interestingly, looking at the Bank of England FX volume figures for FX Options by execution channel, the figures don’t seem to tally with the 166% surge in FX Options volumes in 2015 that the Reuters press release refers to on the Reuters dealer to client platform. The chart below shows FX Options vols by Single Dealer Platforms, showed that vols increased from 4.9% of all FX Options vols to 6.5% between Apr 14 and Apr 15, which is only a 33% increase over the period. So, one can only assume that Reuters 166% FX Options vols growth was from a very low-level starting point. Although, that would still show volumes increasing 5 times faster than the increase observed via single dealer platforms, which was the fasted growing channel.